North Korean leader Kim Jong-un continues to make headlines with his efforts to talk with the South Korean leadership, independently of the United States’ influence. In a new development on Saturday, February 10th, Jong-un invited South Korean President Moon Jae-in to a meeting in Pyongyang, this being done via a personal letter hand-delivered by Jong-un’s sister, Kim Yo-jong, to President Moon. This is in hopes of a third inter-Korean summit. The first two have been highly positive in their nature, and have progressed swiftly since the beginning of the year. Kim Jong-un’s move towards what appears to be a rapprochement was warmly welcomed by the South, and the two nations’ summits have happened independently of any direct US support. The Winter Olympic Games are being held in Pyeongchang, South Korea, and they opened on Friday, February 9th and will conclude on the 25th of this month. The two Korean states have combined their athletic forces into one united Korean team, competing under a united Korean flag. Kim Jong-un’s sister is a member of the North Korean Politburo. She heads the regíme’s propaganda department and she is very close to her brother. She is the highest ranking state head to attend the Olympic games on behalf of North Korea. 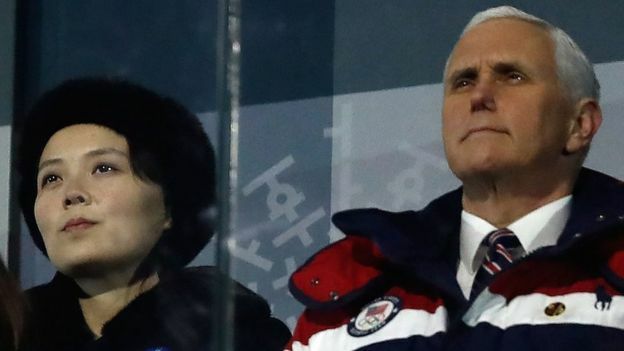 Interestingly, during the opening ceremonies of the Games, she was seated very close to the American Vice President Mike Pence, but the Yonhap News Agency reported that the two tried to avoid directly facing one another. This naturally is a very hopeful sign for Korean people on both sides of the DMZ, but the Americans remain unimpressed, to say the least. The rhetoric from the US President Donald Trump has been strongly supported in equally strong statements by Mr. Pence, both in deed (he was to have brought with him the father of Otto Warmbier, the American student who died just days after being returned to the USA in a coma following imprisonment in North Korea. The American influence might be seen as either a voice of restraint from foolish behavior, or a wet blanket trying to ruin the good times. Of course, this depends on one’s understanding of the situation. The attraction of brother nations reuniting is huge in the region. But the point of North Korea’s reputation for brutality in the treatment of her own people as well as the treatment of foreigners is something that the US maintains cannot be taken lightly or just swept under the rug. This is a matter that the North is going to have to face as the negotiations and meetings continue. While it is clear that the North wants closer ties with the South, it is not clear exactly why, nor is there any indication that the North is interested in undoing its reputation as a most strict, isolated and harsh dictatorship. However, the effect of the charm offensive of Kim Jong-un and his sister is very clear, and there remain signs of hope for some sort of positive change.